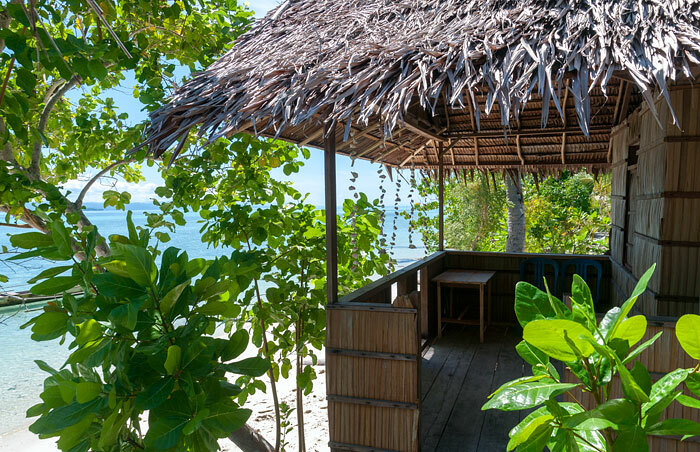 Byuk Beya Homestay lies on the north shore of Pulau Kri and is one of three homestays that inhabit a beautiful stretch of beach at the less developed eastern end of that island. 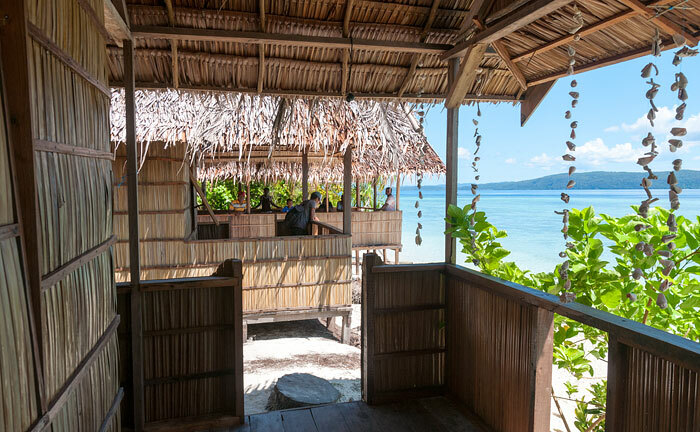 Byuk Beya has three private bungalows on the beach and one on land. 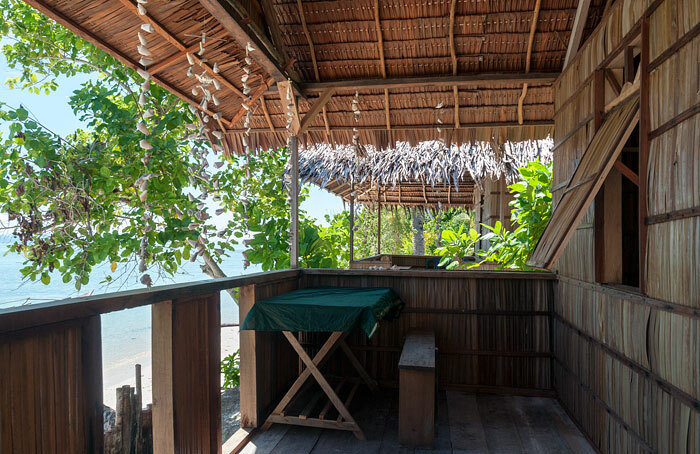 All have verandahs with fabulous ocean views across to Waigeo and Gam. The single room bungalows are shaded by surrounding trees and a table and bench seating is provided on each verandah. Bungalow bedrooms sleep two people on a mattress on the floor which is provided with pillows, bolsters, sheets and a mosquito net. Each room also has power outlets and a room light switch. 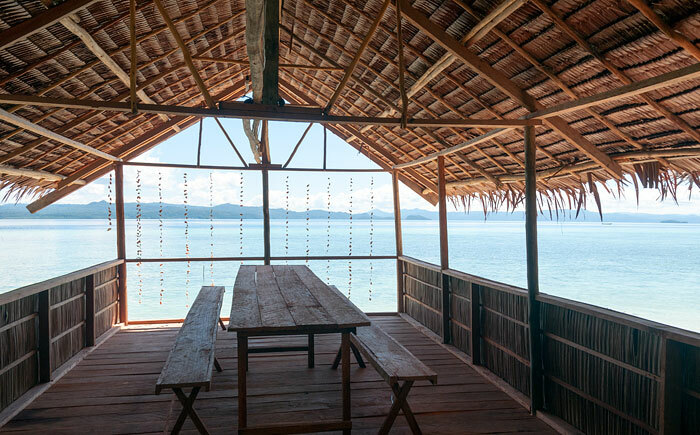 Meals at Byuk Beya Homestay are served in a dining room which is also on the beach and affords the same fantastic sea views. The dining room has a large table and bench seating and drinking water, tea and coffee are always freely available there. All guests share the two roomed, pebble floored bathroom building. 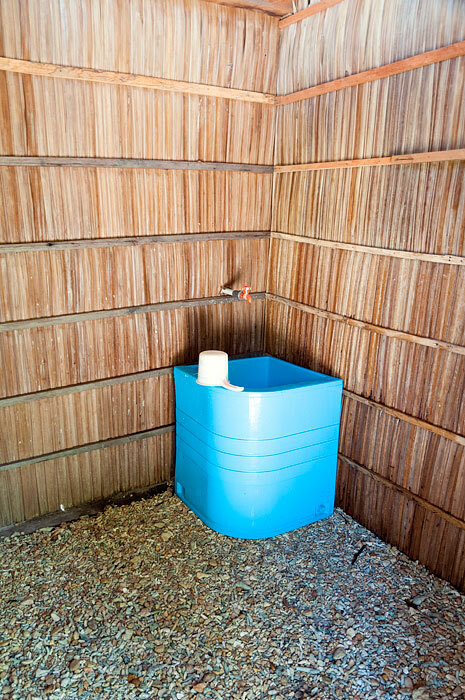 A western style toilet occupies one room – the other is the dip mandi style bathroom. Electricity is supplied by generator and is available from sunset to midnight. Byuk Beya Homestay was only receiving a weak phone signal when we visited in June 2016 and a data connection wasn’t possible. 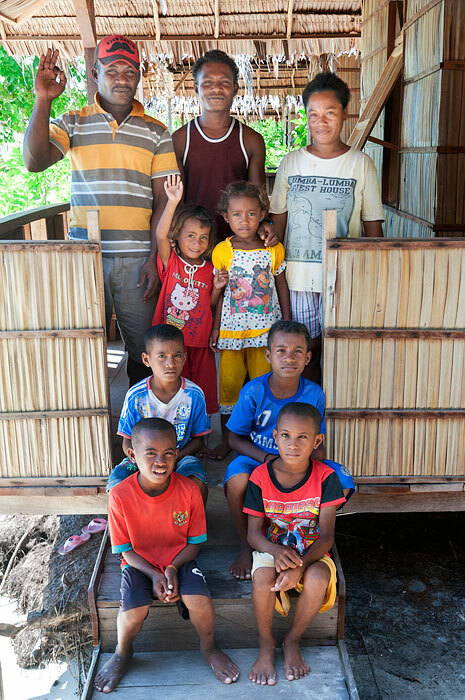 The nearest village for supplies is Yenbuba on Pulau Mansuar, which is about a twenty minute boat ride away. It’s wise to bring any supplies you consider essential with you. Please also take home any inorganic rubbish you make: As in all of Raja Ampat, there is no non-polluting method of waste disposal on Kri and contributing to the trashing of paradise is surely best avoided. Only a little English is spoken at Byuk Beya Homestay, so if you have no Bahasa Indonesia a phrasebook will help ease any communication difficulties. Transport between Byuk Beya Homestay and Waisai is by speedboat and costs IDR 800,000 each way. The boat can carry up to six passengers and trip price is shared. Arborek Transfers: Byuk Beya also provides a transfer service for guests staying at Arborek homestays. A longboat pickup from or dropoff to Arborek will cost IDR 500,000. The longboat used can carry two passengers maximum (IDR 250,000 each). 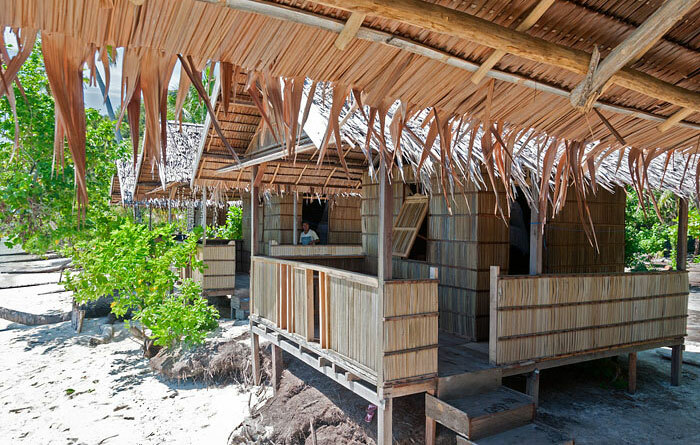 In common with all Kri accommodation, a stay at Byuk Beya Homestay is all about the ocean. 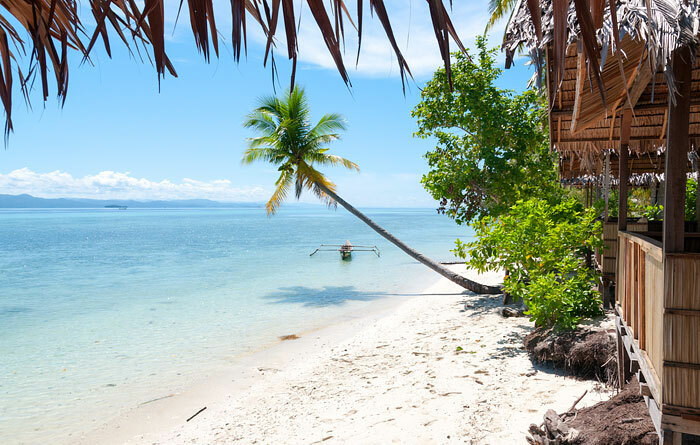 There’s great snorkelling at the door, diving can be arranged with the neighbouring Kri dive centre of your choice and just relaxing and watching the changing sea views from your bungalow verandah is pure bliss. If you’re feeling energetic you can walk the entire north shore of Kri at low tide. You can also cross the sandbanks between Kri and Ransiwor and Mansuar to Yenbuba village. From Yenbuba walk trails run the length of the much larger island of Mansuar. You’ll need an early morning low tide and to arrange a boat pickup at the other end if you want to do all that! Shorter walks to the heights of Kri for panoramic views are also possible. Byuk Beya can arrange snorkelling and sightseeing trips as desired. The sampling of those provided in the table below are quoted in Indonesian Rupiah. Tours are by speedboat, can accommodate up to six people and the quoted cost is shared among passengers. Jolis bungalows papu, cuisine délicieuse et généreuse. La famille est adorable et très arrangeante, même si elle ne parle pas toujours bien anglais. Plusieurs beaux spots de snorkeling à proximité. Parfait ! Staying with lisias, lusy and all their kids was a gift. I spend 10 days with them and was the best I could ask. The food there.. Ohhhhh the food!! Lusy is the indonesia master chef 😊 fish eeeeevery day! everyone was very very kind and leave me my space al swell. About the homestay: is simple and beautiful for my point of view. You are going to have a real experience in the nature. 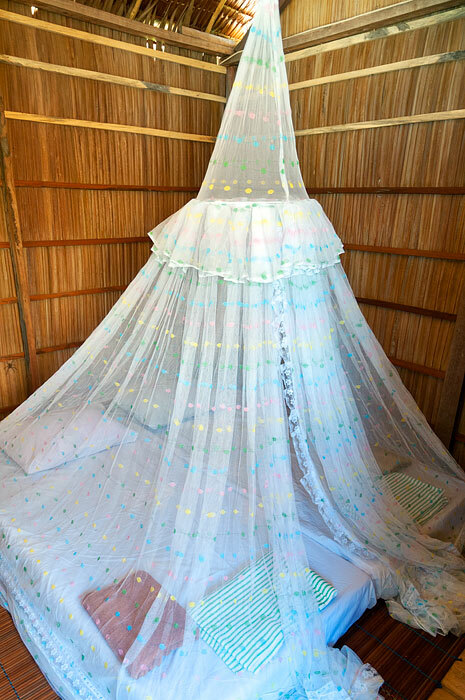 There is a mosquitoes net in every room. The toilet is shared. I did snorkeling every day and just in front of the homestay was wonderful 😀 I met beautiful people in there. Raja ampat is a real paradise and if you think the price is expensive, you will think this place, this food and this people is priceless once here. we spent 3 night at Byuk Beya and it was absolutely amazing! 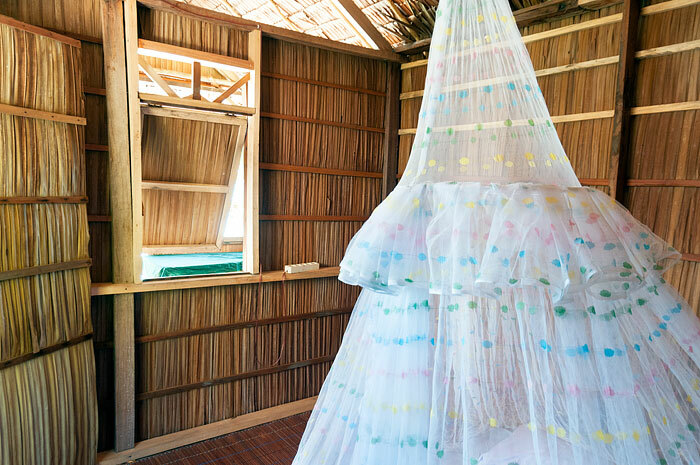 we had one of the beach bungalow with real bed, mosquito net and hammock . The host family is very friendly , the food was various, delicious and more than enough! beautiful beach and snorkeling as well. we really recommend this homestay! Cozy Bungalow pleasant and friendly host, good and a lot of food. We had the best time at Byuk Beya on Kri. The food was delicious and more than enough, the bungalow was specious with proper mosquito net and bed. The shower and toilet was always clean. It is close to Pasir Timbul, so you can easily ask them to bring you there. The family and kids are really friendly and helpful. The sunrises and sunsets were beautiful and the house reef was beautiful. We rent two on-beach bungalows for the whole family (us and two kids age 10 and 11) and we had so much fun for our 4D3N stay. This place is a perfect venue for relaxing, and kids love it so much as they can play on the white-sand beach the whole day! LoL. We did the snorkeling just in front of the bungalows, after swimming crossing the small seaweed garden. We also went to Piaynemo, visit Sawingrai Village to enter the gate of trekking for bird watching (Cendrawasih), snorkel at Mansuar island (at jetty of Sawandarek and Yenbuba), and visit Pasir Timbul (an emerge white sand during the low tide)… and Pak Lisias always happily took us to all the above destinations. In order to reach this homestay, from Waisai Jetty (and vice versa), you need to have a 10 minutes walk to FIN area (small jetty for smaller boat). There, you will pay for the entrance ticket for marine park, and you will meet Pak Lisias there. Make sure that you checklist the boat-transfer request when you book this homestay, and re-inform Pak Lisias several days before your arrival date. The journey took about 40-60 minutes from FIN to Kri island. 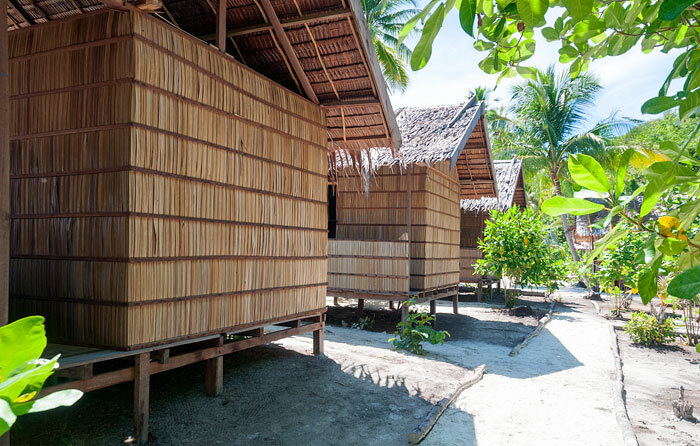 The bungalows are clean, neat, equipped with basic stuff (desk, chair, hammock, mosquito’s net and bed, towels for two). Aside of the bungalows, there is an open dining area by the sea where you can take your 3-time meals, coffee and tea. Meal times are always fun because the foods are delicious (All are Indonesian dishes and Ibu Lucy cooked very well) and it is the only time when you can meet and talk with all the guests around. 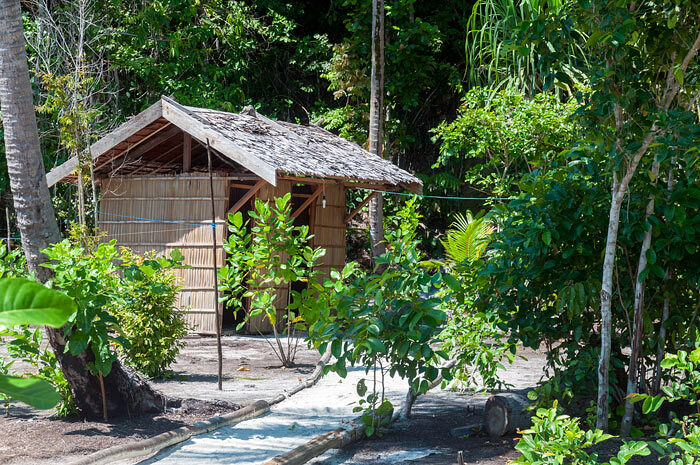 For the shared bathroom and toilet (separated, but side by side), they are clean, and you need to walk about 10-15 meters from the bungalows. Electricity and water will only available during 05.00 pm up to about midnight. We stayed 8 nights in buyk beya homestay and had a lovely time. The food was good et Lisias was often asking us if we needed a boat drive. The room was great with an amazing view. A fan would be great because it get really warm in there during the night. The only thing disturbing was the shower because it was salty, so we never fell totally clean. At the end we were taking shower in our dive center. Anyway we really enjoyed our stay there. We stayed for 4 nights at the homestay and we really enjoyed the place. The location is lovely, the food is good and the family is very nice if you get to know them a little. The trips we booked with Yenkoranu and Delvin Homestay. We really recommend to book your trips at these places, the staff is lovely and very helpfull. We had a fantastic 6-day stay at Byuk Beya. The place is as wonderful as shown in the pictures. We had one of the beach bungalows, which had a hammock (not shown in the pictures), a proper bed and many power outlets. Electricity runs approximately from 6pm to 11pm, which was more than enough to charge everything. Lucy’s food was great, with plenty of fish and fruits, served in the dining area, a perfect place for socialising with the other guests. 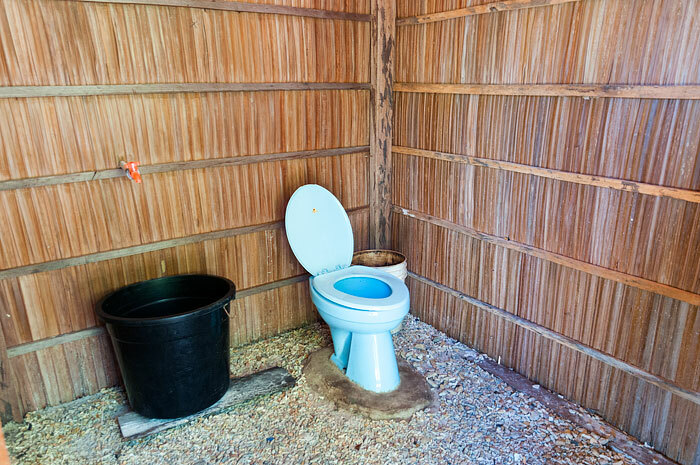 And the toilet and the shower were basic, just like everywhere else on the island. But what it made a difference, apart from the place itself, was the family and the kids. It was so nice to spend time with them and play footvolley with the boys in the evenings. We organised the pick-up with Jitro via WhatsApp one day before arrival and everything went perfect. If you plan to buy an indonesian SIM card, just keep in mind that the only provider serving Raja Ampat is Telkomsel. I bought one from XY and it did not have any coverage at all. Wir hatten einen tollen Aufenthalt. Das Essen war super und sehr abwechslungsreich. Es hat uns an nichts gefehlt. Schnorcheln kann man direkt vom Strand aus. Getaucht sind wir mit dem benachbarten Dive Center (Yenkouba). Auch der Transport von Waisai aus hat perfekt geklappt. I will honestly never recommend staying in this place for a girl. The guy Jitro was harassing me calling me every now and then at night and texting me weird stuff and saying things like I like you I ignored all the above ones, but the biggest choc was when he said he’ll take me for free to piyanemo ( As we were planning a trip there with other guest) « I say/do something nice to him » what the hell, this was extremely inappropriate and During all my stay I didn’t feel comfortable I felt so scared I was worried that he will do something bad to me… Hopefully, I stayed with other guests so I had some company. Ya baik atas semua yg menjelekkan tapi pada waktu itu saya bersedia untuk jemput bagaimana dengan tamu saya yg punya trip ke pyainemo sedangkan saya mau bicara ulang homstai yang mereka tinggal tidak ada jaringan untuk komonikasi dan pada saat itu saya pulang trip saya ingin mau jemput tapi tempat sangat jauh dengan waktu 4 jam perjalanan dengan spit bood..dan saya takut kalau bawa mereka malam saya ada masalah yang fatal.tapi saya minta maaf atas semua yang terjadi. maaf hajar saya pikir hal yang disampaikan hanya dengan bermain dan pada waktu itu rencana snorkling saya siap tapi kamu di ajak sama luki untuk di bawah untuk snorkling dan malam saya esemes lewat watsapp dan saya bilang saya sangat suka sekali bawah kamu snorkling..dan kamu katakan lagi saya minta kamu gratis ke pyainemo jadi saya bermain saya bilang sama kamu saya kasih gratis tapi kamu kasih bonus..saya bermai sama kamu begitu tapi saya juga tidak seperti itu..maaf hajar kalau ada yang salah saya minta maaf. Very bad experience with the owners of this Homestay. We were in West Waigeo (quite far, with no telephone) and wanted to come back south. A couple of days before I went to the village of Selpele to get telephone line (by boat, not so simple thing) and asked the contact center of stay Raja Ampat some numbers for Kri Homestays. After trying with a few but having no answer, I managed to speak with Nyuk Beya. I arranged pick-up to our Homestay after 2 days at 1 pm and we agreed a price. On the given day we waited (with no telephone line) until 3 pm but no one showed up. We then went to the village and called again. The owner candidly told us that he had changed his mind because the price we had agreed was too low to come and pick us up, although he knew that we had no phone and could not communicate further after we agreed. It was too late by then (4 pm) to come even for a higher price. We really wanted to leave West Waigeo after two days of hard rain and the sea full of jellyfish so we were really disappointed by this behavior. Totally unreliable and irresponsible. We lost two precious days in Raja Ampat (out of 10 in total) because of this very bad experience. As advised in section 5 of our “How to Get to..” page, it’s always easier and usually much more reliable to arrange with your current hosts to transfer you than to try to get your next hosts to come and pick you up. To help others avoid this problem, are you willing to disclose the price you agreed with Byuk Beya? Had a wonderful stay in Byuk homestay, the family is amazing, extremaly nice people, good food, always ready to help, they made the stay even better. Stayed 3 nights in the beach bungalows, the high beds are great, the beach is beautiful and with a 15 minutes walk you get to amazing reefs for snorkeling. 100% reccomended. I seriously had the best time at Byuk Beya Homestay. I stayed there for 5 nights. The owners were helpful and nice. When I was there, I was the only guest but the lady cooked the best meals just for me. I had plenty and various dishes. I think I got fat staying at Byuk Beya 😂 everything was super delicious. The location is superbe as you can just go snorkeling around the corner. I did the Pianemo trip as well, which is something one has to put in his bucket list. The huts are located near Pasir Timbul. I think I experienced the best sunsets in my life so far. Everything was perfect. I know Raja Ampat is like “once in a lifetime experience” but who knows; whenever I’ll be able again to go there again, for sure Byuk Beya is the place to go. Kri Island is awesome as well, there are plenty of dive centers where you can book your dives/snorkeling trips. Siamo stati ospiti per 13 giorni ad agosto e Jitro e la sua splendida famiglia sono stati assolutamente perfetti. Il cibo era vario e quando raramente non c’era pesce la signora gentilmente si scusava ma i piatti in sostituzione erano comunque buonissimi. Gli ospiti mangiano insieme ad un grande tavolo vista mare che favorisce la socializzazione. I bungalow sono essenziali ma puliti e comodi e la posizione è da sogno ad occhi aperti. Il bagno e la doccia con mestolo in comune sono sempre puliti. We have been guests for 13 days in August, Jitro and his wonderful family were absolutely perfect. The food was varied and when there was rarely no fish, the lady kindly apologized but the dishes in place were still very good. Guests eat together in a lrge table overlooking the sea that encourages socialization. The bungalows are basic but clean and comfortable and the location is dreamlike. The bathroom and the shower with a ladle are always clean. Thanks for the wonderful holiday. I had an amazing stay at Byuk Beya Homestay! Jitro and his wife are great hosts. They made everything for me to have a great stay. The food was amazing and different meals were served every day. 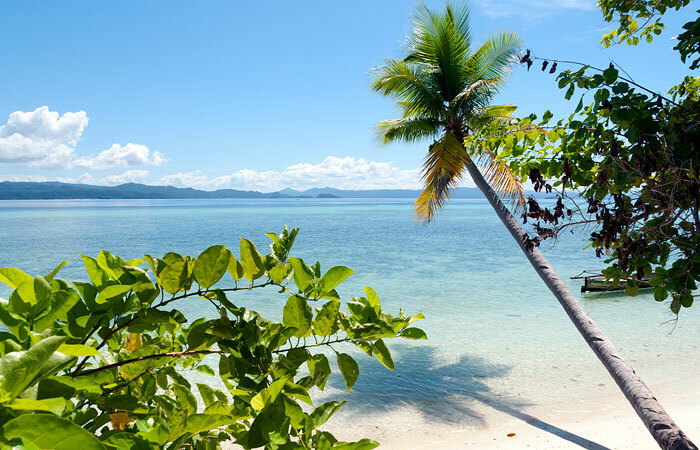 The location is really good: wonderful beach and a reef not far for great snorkeling. Joshua who was running the show here whilst we stayed, was so helpful! He speaks perfect english, and was super willing to acommodate our every need, from transport to snorkelling and food! Absolutely recommend. Spent almost a week in total, spread out over two stays. Kri is a good place to find other travellers to share boats with for further remoter areas. My Indonesian gf and me stayed a few days at this homestay and we basically had a good time. Especially the over waterbungalow was a sweet choice for us. The guys from the homestay were helpful. Anyhow our expectations of a 5-sea-star homestay were not fulfilled: One thing that we couldnt understand was that we could NOT get any fish or fruits during our stay (That was the only homestay where was this situation). I mean you could just get fish with your own fork during snorkling cause there are so many fish! Even if we actively asking for that..no fish. Second thing that was weird and little serious, since we wanted to go back Wasai (then Sorong), so we asked 2 days ahead for a boat, but the homestay couldnt provide their boat neither manage to find a boat! We asked the day before in the homestays around, but almost no guests there so no boat leaving from there/available. Anyhow we found by ourself a totally overpriced boat and had to bite the bullet. The funny thing is that late in the night before leaving, the guy of our homestay said, that he will go the next morning to Wasai to pick up customer..?!?! ?..Anyhow we didnt want to change to another deal…regarding that topic this homestay was not reliable at all. We stayed at Byuk Beya from 12 till 17th of january. The location is pretty awesome and the family where you stay is trying I hope. but communication is terrible. I send them several messages to arrange pick-up which where all replied with OK of anything like that. But the day we arrived at the Wasai airport there was nobody there. So we got ripped of by some taxi driver because they now you have no choice. We we arrived and asked why they were not picking us up there was some lame excuse but we got the feeling they had no idea that we were coming. We arrived on friday and arranged for a snorkeling trip on sunday, asked them several times if it was ok to go on Sunday, but this was no problem. Sunday morning when we got ready to go they told us sorry but today is Sunday we don’t do trips on Sunday. So again a day lost. Food was always plenty but the first three days we diddn’t get any fish of fruit. We asked several times for fish but there was always the answer “sorry today we diddn’t catch fish” but you could see the family eat fish anyway. For 700.000 rupia with two persons they should provide some fish with dinners. Always ask for steep discounts because they seem to have no idea of the value of money and for the smallest things they will just ask 100.000 rupia. Next time we will definately go somewhere else. Thanks for taking the time to leave a review. Your feedback will be passed on to Byuk Beya, and hopefully they will address the issues you’ve raised. As explained on our “How to get to” page, homestays pick up from the harbour, not from the airport, so guests flying in to Waisai do need to get a taxi to the harbour to meet their homestay boat. Also mentioned at the foot of the “How to get to” page (and explained in detail on other site pages) is the fact that no homestays offer any kind of activities on Sundays. Waisai pickups and dropoffs will be arranged if necessary, but no other boat activities are available on Sundays. It’s a shame Byuk Beya didn’t have the confidence to explain that to you when you first asked them about it. I stayed more than a week at Byuk Beya Homestay and I had a very good time there. The whole family is very friendly and they really try their best to make their guests comfortable. The place is very clean all the time, food is plenty and very good. One has to remind that this is an island far out and away of supermarkets and grocery stores. The snorkeling on the house reef is not so great, but snorkeling trips to wonderful spots can be arranged. Quite and peaceful, cockatoos in the trees behind a little jetty to relax and watch the sunset. Great homestay on Kri close to dive centres. Joshua and family were very friendly and helpful. Bungalows are quite close together and are also surrounded by other homestays so there isn’t much outdoor space to relax. We thought this would be a problem but it wasn’t as you can walk along the beach to explore the rest of the island. 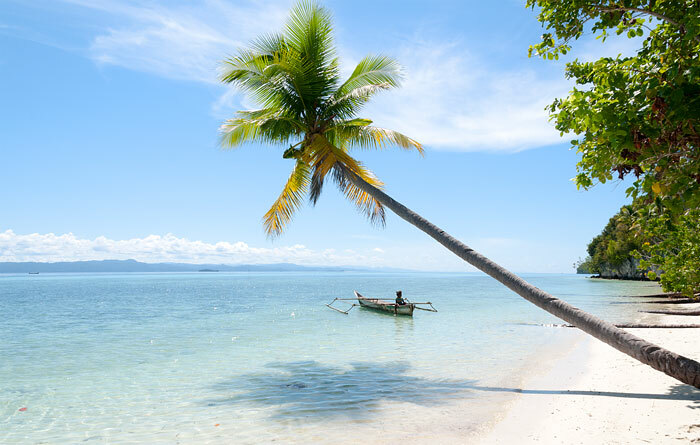 Beach is nice but there isn’t one at high tide and the water is very shallow at low tide – it is easier to walk up to a dive centre further up and snorkel from their jetty. We did the Pianeymo trip with the homestay – this was well organised and I would recommend. Bungalows were very nice inside and clean. Bathrooms are good. First of all, I wanted to book the homestay close to Waisai but after reading all the comments on Byuk Beya homestay I changed my mind and booked a room on Kri island. Everything went really smooth – Jitro communicates with me from the beginning, picked us up in Waisai harbour as we arranged and he was really helpful. The room was fine and food is very delicious. They can also organise snorkeling trips for you or go to the diving centre (10 min) to share the trip with more people. We really enjoyed our stay with Jitro´s family! Stayed at Byuk Beya for one week. Great food, nice people, awesome beach. Beautiful and quiet beach, probably the best on Kri Island. You can swim in front of the bungalow, surrounded by palm trees. Hosts and especially Jitro were very nice. Food was okay, bungalows are the best we know on Kri (we stayed at 5 different places on Kri over the last years), spacious and clean. There was also a real bed in the bungalow – instead of just a mattress on the floor like in most other homestays. We enjoyed our stay a lot an can highly recommend it. I had a nice time at Byuk Beya Homestay. The people are verry kindness it felt like family. The food, the vieuw everything was great. A beautiful place to stay, i am gonna miss it. Can you please let me know how did you communicate with this homestay? They are answering to my open questions only “yes..” and “ok..”. I’m not sure if they will pick us up at Waisai and if they have our reservation at all.. I also wrote in Indonesian, but got the same answer.. Most guests find that the easiest and most reliable method of arranging their stay is to use the booking form provided above. You can request a Waisai pickup using the form and homestays usually respond quickly. Here is how it works. It has been fantastic!!! we have been one week in Jitro’s home stay, and we felt at home, the food of his wife was sooo delicious, each day with something different, cakes, fish, chicken, vegetables, fruit. All was really clean and safe, they clean up our bedroom everyday. Jitro came to Waisai to look for us and he also manage to help us with doing dive, snorkel with the other homestays so we can share costs. Yo can go walking to the divings homestay were is more. peolple and beer or cokes of you want or stay peacefully in the homestay. The snorkel in front of the homestay is very good. Thanks you very much for everything and to your family!! After leaving Jitro Maila, SMS and phone Calles, he still picked me up 3 hours late in Waisai. Got to the Homestay late and very wet. The place is as awesome as the picture. Food is good and always on time. His 6 kids are really nice. He was making a new bed when I was there, maybe there wore the old one down. No good snorkeling from his beach. You have to walk left for 800m, take the second of the long Piers, here you find good refs and lots of fish. The huts are cleaned everyday, toilets are fine etc. If you wanna do trips and wanna svare costs, it is better you walk to the secound pier at the left, Yenikanu.. I think its called. Yenikanu is quite full and offers fantastic and cheap diving. Very very nice Family. We stayed four nights at Byuk Beya. We really had a great time chilling out and snorkeling in different places Jitro brought us to. We definelty reccomend this place!! Thanks to the whole family!! Such a lovely family and welcoming place to stay. The food was delicious and the kids cut down coconuts for us to drink. From here we walked to a village at low tide and snorkelled round the corner where we saw reef sharks and plenty of fish. A beautiful place to stay! I miss this place. We had a great time in this homestay. The food was excellent!! Thank you Jitro and family for making our stay memorable. Rooms are clean, bathroom and toilets as well. Thanks much! Highly recommended! We spent 9 days in Kri and without a doubt this was our favourite homestay and stretch of beach. To the right of the beach and around the corner there are some stunning turquoise waters to float around in, a little before (near the pole with white marker) is a great snorkelling spot with a variety of fish and coral. You can swim to the picturesque sand banks at low tide. To the left you can head to the jetties where you will find black tips sharks, turtles etc..
Jitro can arrange all sort of boat trips. Manta point is amazing. We actually did a two day trip to Wayag with overnight stay and also stooped off at Pianemo, Manta point and Arborek. Ideally you would need a group of 6 to make it cost effective (around 2,500,000€ each). There are only 3 bungalows and all beachfront. It’s recommended to book ahead. The rooms and bathroom are cleaned daily. We were 3 friends travelling Raja. We loved staying at Byuk Beya. The family is so nice, we felt really welcomed. Everything was as it should be: Jitro came to pick us up at Wasai, the bungalows are clean and new, food very tasty and a lot of it. We were never hungry or thirsty. Bathroom is clean, but do not expect luxury, this is a homestay. If you look for peace and qiuet to rest, this is the place for you. If you look for people and party – not for you. The trips with Jitro were nice and he even drove us in the morning to Yenkoranu to make some scubadiving. One thing – the diving with nextdoor ECOresort is not possible, they do not take outsiders. And please beware of the homestay neighbour mister Luki Yenbuba that organizes daytrips to WAYAG – the trip in reality takes 10 hours (he says 6) and you drive back at night and is DANGEROUS. Lesatnya makanan di byuk beya homestay dan juga kamar tidur dan toilet sangat bersih,awalnya kami mau ke byuk beya kami sangat kawatir dengan byuk beya setelah sampai di byuk beya keluarga di byuk beya sangat prihatin sama kita,kita sangat senang di byuk beya. Timakasih jitro lusias dan lusy. Very very nice Family. We stayed one week at Byuk beya. We really enjoy our stay, they all are very very helful , we definelty reccomend this place. Thank you to the family. Willy,Jitro,Lisias,n Roberto. Great boat Ride all around. Sangat indah byuk beya homestay. Trimakasih byuk beya homestay atas pelayanan nya mulai dari hari pertama hingga tiga hari berahir nya berjalan dengan lancar. Spent 7 nights at the homestay, while diving with wobbegong diving on the other side of the Papua Dive resort. Walked there or they came and picked me up. It was an economical way to dive Raja Ampat. The homestay is basic, hosts friendly, and they try their best, but would benefit from some hospitality training. I tried to give them some pointers, as while I was there two other couples (French and Singaporean) were not happy and left early. The main problem was that they were charged excessively for two excursions. I also was also asked initially to pay excessively for the boat ride to / from Waisai. I tried to explain that tourists do not like that, and it is better to have reasonable fixed prices like the advertised daily rate. Generally the food was pretty good, although they ran out of fruit and veges while I was there! Also breakfast was a bit plain: bread, with nothing to go on it, good job I brought vegemite with me. I hope this does not sound too negative, as I hope they go well. Wir waren 7 Tage im Byuk Beya. Das Abholen von Waisai verlief reibungslos und wir wurden freundlich empfangen. Die Bungalows und das Bad sind einfach aber sauber. Jeden Tag gab es sehr gutes Und frisches Essen, mehr als genug. Hungern muss man wirklich nicht. Kaffee, Wasser und Tee konnte man jederzeit nehmen. Brand new homestay, very nice bungalows with a great view and nice beach. Bungalow, toilets and bathroom were very clean. We stayed for 4 nights in september but we decided to come back here for the last couple of days of our trip because we liked it so much! Such a nice and helpful family and Lucy is a great cook, the food varies every day and she even made us bread for breakfast! Would definitely come back here next time! We had a very nice stay at Byuk Beya Homestay, thanks again Lucy and Lisias!